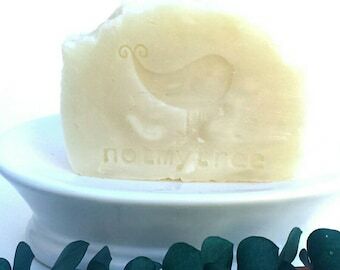 Handmade soap and natural spa items for women and men. Announcement Welcome to Not My Tree! 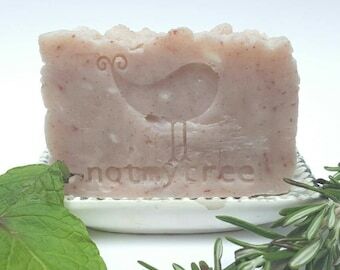 I specialize in natural, handmade soaps and body care. 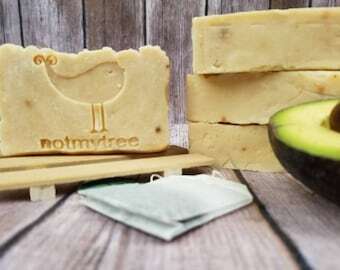 ♥ new soaps will not be wrapped in shrink wrap, thus lessening our carbon footprint by eliminating that plastic. Once our current stock of shrink-wrapped soaps is gone, we'll be packaging all of our bar soaps using only a simple cardstock band that lists ingredients and contact information. ♥ body butters will now be available only in a 5.5 oz size so we can present them to you in repurposed, recycled glass jars. They're fancy, they're durable, and did we mention they're recycled? 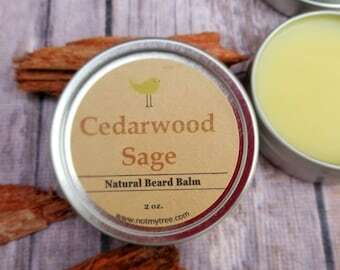 ♥ we are expanding our product line to include scents not just found through essential oils. 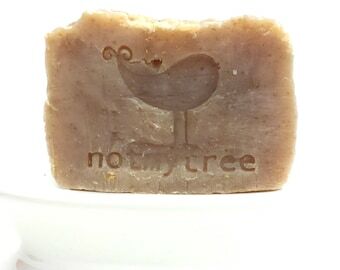 Of course, we'll still have our line of all-natural products (Not My Tree Naturals) if you're looking for products scented naturally with essential oils and botanicals. But we'll also have scents you've long requested, including coconut lime verbena and bay rum, made with phthalate-free and skin-safe fragrance oils. We'll still use the same natural base ingredients in all of our products, so you can still feel good that they're wholesome and good for your body. Soaps are made from scratch in small batches, so I know every ingredient that goes into each bar. I don't use melt-and-pour bases or synthetic dyes. 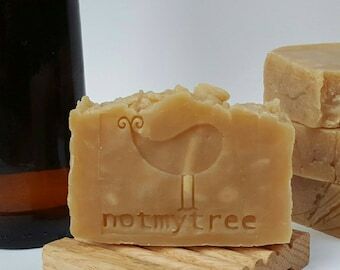 I started making soap because I wanted the best, purest bars for my family, and I continue that line of reasoning into the products I list in my shop. Please note that I accept both Etsy Payments and PayPal as payment methods for my items. ~ Convo me through Etsy. I'd love to hear from you if you love something you see, have a question about an item, are interested in a custom order, or would like to set up a trade. ~Browse my blog (www.notmytreeblog.blogspot.com), which features tutorials to inspire you to upcycle and recycle some of your own wardrobe. You can do it! You can contact me through there, too. Welcome to Not My Tree! I specialize in natural, handmade soaps and body care. 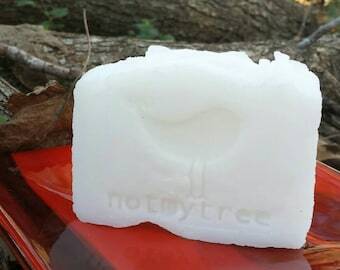 Very nice soap. Thank you. Headbands from a combination of new and recycled fabrics to make fresh accessories from discarded textiles. Good, old-fashioned soap, just like your grandma used to make. 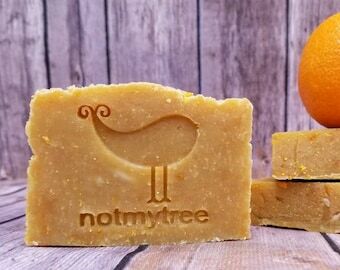 Crafted with lye, oils (often organic) and essential oil. Fabric grocery & tote bags from upcycled linens and pillowcases, with limitless embroidery and personalization options. Wedding & cocktail napkins from upcycled fabrics for eco-friendly celebrations with an emphasis on sustainability. Custom quilts from upcycled fabrics for eye-popping decor and snuggle-on-the-couch moments. Saving the planet, one bar of soap and discarded textile at a time. Because superheroes come in all forms, most of them imperfect. I don't know if I can claim the superhero title yet. But I have the imperfect part down pretty perfectly. I sew (almost everything) using recycled textiles. I make soap (I DREAM about soap). I am a perfectionist, an idealist, and a woman. In a nutshell: I am a mother, a wife, a teacher, a seamstress and a soaper. Over the course of a year, I came to realize (through some very tough lessons) that my job, rather than being an obstacle to my creativity, was actually a catalyst for it. Now being several months removed from a series of unfortunate events, I am a better and more fulfilled...everything. I have a razor-sharp focus and am more committed than ever to building an earth-friendly, sustainable part-time business, creating things I love using materials I believe in without the stress and burden of past decisions weighing on me. Welcome to my carefully-constructed, hard-won corner of the world. I'm glad you're here. I love fabric, soap, dogs, water, reading and quiet. I can't stand willful ignorance, hypocrisy and death metal music. Samantha from HooksandneedlesArt creates the soap savers, face rounds and shower poufs in my spa baskets. Her natural cotton items add the finishing touch of luxury to my gift sets. Samantha creates all of the soap savers, face scrubbies and shower poufs in my handmade spa baskets. 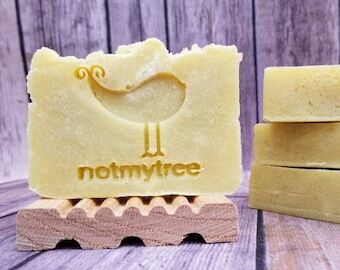 Her items really add the finishing touch of luxury to notmytree natural bath and body sets. 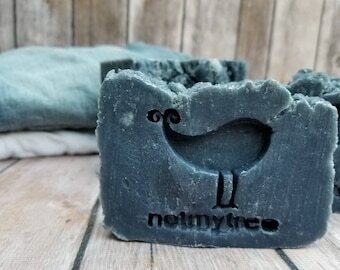 Responsible for the construction of the wooden soap dishes sold as optional add-on to create gift sets with my soap products. For purposes of EU data protection law, I, Michelle Meehan, am the data controller of your personal information. If you have any questions or concerns, you may contact me at michmeehan@yahoo.com. Alternately, you may mail me ~ please contact me via email for my mailing address.